Call (925) 269-9399 to get an estimate on pool repairs. Concrete or Gunite Pool Repair - We start by omitting the components faulted by the crack. A bead of caulk is applied to cover the crack after the components have been rinsed and dried. The caulk is left to dry for 24 hours. We moisten the concrete edges of the crack, applying a pool patching mixture to the crack. After the repair work is done, we fill your pool. Swimming Pool Plaster Patching - We remove any loose plaster, chisel some divots and pock marks into the patching surface. These steps are then followed by acid washing the surface. We prepare the pool patch taking into consideration the color of the pool’s walls and prepare the plaster mix. We apply the plaster mix and keep it moist until it is under water. 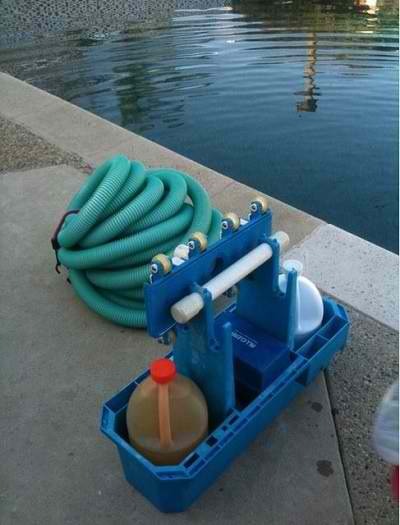 Fiberglass Pool Repairs - We repair fiberglass cracks, blisters and bubbles. We disk sand the area around the crack and apply the bond to coat the crack area. The polyester putty is catalyzed and applied to the crack. A 2-inch masking tape is applied around the area of repair as we apply a gel coat. We lay the fiberglass cloth and allow the repair to dry. Vinyl Liner Pool Repair and Patching - Rips and tears in your vinyl lined pool will be no more after we have embarked on this issue. The area to be patched is cleaned with the vinyl patch material cut to about ½ size larger than the hole. We apply the vinyl glue to the area around the hole to enable patching. The patch is submerged, unfolded and quickly stuck. Above-ground Swimming Pool Repair - Many of this type of pools experience leaks in the liner of the pool due to its exposed structure. Leaks in the liner are repaired by installing an adhesive patch over the leaking area. Pool Cleaning - This is one of our specialties whereby we thoroughly clean your pool. We skim off leaves and debris, brush off dirt, hook up our vacuum to your filter and clean your skimmers. Afterwards we check the water circulation and your filter, cleaning them to make sure that they are perfect condition. Pool Maintenance - We provide both weekly and monthly pool maintenance services. We visit our clients and remove any debris, feeding the pool with chlorine or sanitizer. We test and adjust pH, oxidizer and stabilizer levels, shocking the pool. Installation of Pool Covers - We install pool covers for our clients. We use corrosion resistant materials which allow for a long lifespan of your swimming pool cover. We include a set of brass flanges which we install on the anchor thereby adding a more attractive appearance and touch of class to your deck. Swimming pools are fun and relaxing luxury features for our homes. However, they have their own share of expenses to make them usable. We carry out our work diligently to help you get the best out of it. Call (925) 269-9399 for free estimates.